We have a huge selection of used Land Rover Range Rover Sport cars available here at Grange. The vehicles are sure to instantly catch your eye, especially due to the car’s exterior being etched with strong body lines and being complete with a stylish floating roof. 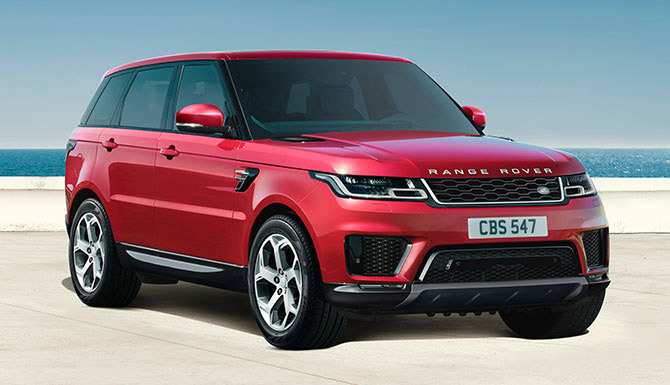 Driving the used Range Rover Sport is a joy too, thanks to Land Rover choosing to design the driver's controls ergonomically so to encourage an experience behind the wheel that is always engaging and intuitive. Discover the luxurious used Land Rover Range Rover Sport by browsing the range and making an enquiry online today. 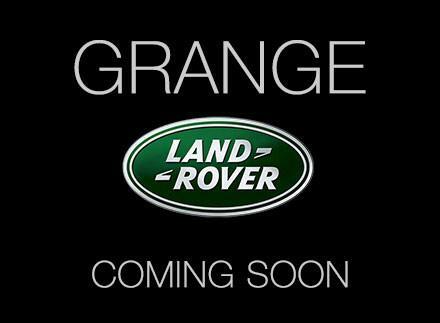 You can also see the vehicles up close at our Grange Land Rover Barnet, Grange Land Rover Swindon, Grange Land Rover Hatfield or Grange Land Rover Woodford car dealerships. Specifications and Equipment includes 21 Inch 5 Split Spoke Style 5007 Diamond Turned Grey Finish Alloy wheels, HDD Satellite Navigation,Dual Zone Climate Control, Keyless Entry, Bluetooth Connectivity, Privacy Glass, Heated Front and Rear Seats, Front Parking Sensor, Push button start, Rear parking Sensors, Reverse Camera, Climate Control, Electric Front Windows, Electric Mirrors, Electric Seats, Air-Conditioning, Cruise Control, Automatic Headlights, Automatic Wipers, DAB Radio, Heated, Multi functional Leather steering wheel, Sliding Panoramic Roof, Electric Deployable Side Steps, WIfi Hotpsot, Black Pack,and many more features. Unique colour combination at great value for money.This vehicle has been fitted with £1,980 worth of optional equipment including Heated front and rear seats, Privacy Glass, Customer Configurable Interior Mood Lighting, Chile Premium Metallic.Standard specification highlights include 20inch Alloy Stormer Sparkle Silver Wheels, 16-Way Electric Front Seats with Memory, Rear View Camera, Park Distance Control Sensor Front, HDD Navigation System, Heated and Power Fold Mirrors with memory, Heated Front Windscreen, Starter System - Stop/Start, Electric Heater, Adaptive Dynamics, Xenon Headlamps with LED Signature, Cruise Control, Headlamp Power Washers, Front fog lamps, DAB, Hi-Line Audio System. Specifications and Equipment includes Satellite Navigation, Bluetooth Connectivity, Xenon Headlights, Reverse Parking Aid, Heated Front Seat, Alloy Wheels, Cruise Control, Drivers Airbag, Climate Control, Height Adjustable Drivers Seat, Leather Seats, Passenger Airbag, Power Steering, Radio/CD, Rear Electric Windows, Remote Central Locking, Side Airbags, Steering Wheel with Multi-Functional Controls, Heated Front Seats with Heated Rear Seats, Two-Zone Climate Control, 8in Touch Screen, Bluetooth Phone Connection, Power Adjustable Steering Column, Front and Rear Carpet Mats, Heated Windscreen, Eight Speakers, Cruise Control with Active Speed Limiter (ASL), Voice Control - Say What You See - Intuitive Voice Control (SWYS), Power Windows (Front and Rear) with Remote Power Locking, Rain Sensing Windscreen Wipers, Keyless Entry and many more features. Call us now for more information. 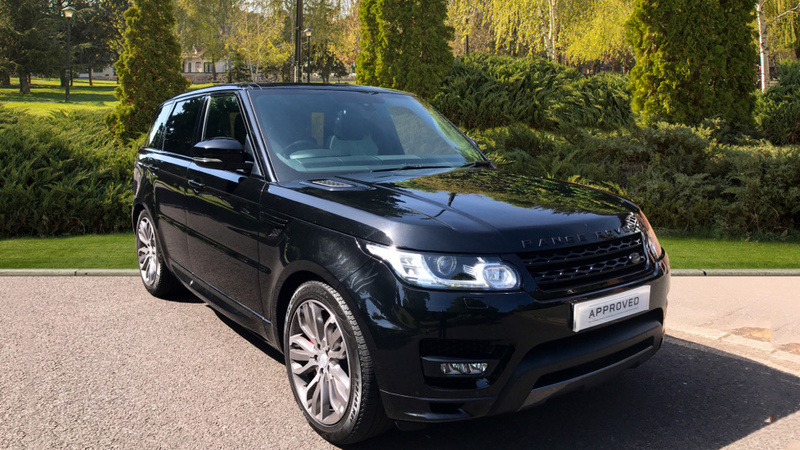 Our Range Rover Sport is fitted with £2,730 worth of optional equipment including Sliding Panoramic Roof and Heated and Cooled Front and Rear Seats. It is finished Metallic Firenze Red Paint with Almond Espresso Leather Upholstery plus 21 inch Alloy Wheels. Standard specification highlights include Rain Sensing Windscreen Wipers, Isofix Preparation, Hill Decent Control, Front Parking Sensors, Daytime Running Lights, Bluetooth, Auxiliary Connection, Automatic Xenon Headlights, 8 inch Touchscreen, Heated Front Windscreen, Navigation System, DAB Digital Radio, Two Zone Climate Control, Auto Dimming Rear View Mirror, Adaptive Dynamics, Tyre Pressure Monitoring System, Powered Tailgate, Electrically Heated Door Mirrors, Front Parking Sensors, Keyless Entry, Terrain Response System, Cruise Control, 8 Speed Automatic Transmission and 16 Way Electric Front Seats. Specifications and Equipments includes Power Front Seats, Red Brake Calipers, Cruise Control, DAB Radio, Double Locking Soft Door Close, HDD Navigation System, Leather Steering Wheel, Meshed Aluminium Trim Finisher, Morzine Headlining, Solid Paint, Reduced Section Alloy Spare Wheel, Privacy Glass, Heated Front and Rear Seats, Configurable Interior Mood Lighting, Rear View Camera, Climate Control, Rear DVD player and many more features. Call us now for more information or to arrange your Test Drive. Specifications and equipment includes 20inch Stormer Sparkle Silver Alloy Wheels, Roof - Sliding Panoramic, Privacy Glass, Xenon Headlamps with LED Signature, Headlamp Power Washers, Front fog lamps, Rear View Camera, Park Distance Control Sensor Front, Heated and Power Fold Mirrors with memory, Heated Seats - Front and Rear, 16-Way Electric Front Seats with Memory, Ambient Lighting, Cruise Control, DAB, Hi-Line Audio System, Adaptive Dynamics, Heated Front Windscreen, Starter System - Stop/Start. Specifications and equipment includes 22inch Alloy Wheels, Rear Seat Entertainment, TV Receiver Digital, Heated Seats - Front and Rear, 16-Way Electric Front Seats with Memory, Roof - Sliding Panoramic, Park Heating With Remote Control, Heated and Power Fold Mirrors with memory, Park Distance Control Sensor Front, Surround Camera System, Reverse Traffic Detection, Blind Spot Monitor, Closing Vehicle Sensing, Dual View Touchscreen, DAB, Meridian Surround Sound System, Adaptive Dynamics, Heated Front Windscreen, Starter System - Stop/Start, Privacy Glass, Adaptive Xenon Headlamps with LED Signature, Headlamp Power Washers, Front fog lamps, Ambient Lighting, Cruise Control, Double Locking. This vehicle has been fitted with £5,580 worth of optional equipment including Fixed Panoramic Roof, Climate Front Seats with Climate Rear Seats, Park Assist featuring Parallel Park, Parking Exit, Perpendicular Parking and 360? Park Distance Control, Lane Departure Warning with Traffic Sign Recognition, Grand Black Veneer Finisher, Red Painted Brake calipers, Customer Configurable Interior Mood Lighting, Front Centre Console Cooler Compartment, Firenze Red Metallic, Leather Heated Steering Wheel.Standard specification highlights include 21inch Alloy Wheels, Heated Seats - Front and Rear, 16-Way Electric Front Seats with Memory, Rear View Camera, Blind Spot/Closing Vehicle Sensing, Heated and Power Fold mirrors with memory, Xenon Headlamps with LED Signature, 4 Zone Air Con, DAB, Hi-Line Audio System, Active Roll Control, Adaptive Dynamics, Heated Front Windscreen, Cruise Control. This vehicle has been fitted with £2,030 worth of optional equipment including Heated and cooled front and rear seats, Privacy Glass with Solar Attenuating Windscreen, Full Size Spare Wheel. Includes toolkit, Twin Blade Sunvisor, Extra Large Additional Washer Bottle.Standard specification highlights include 20 inch 5 Split Spoke Style 520, 16-Way Electric Front Seats with Memory, Rear View Camera, Rear Parking Aid, Park Distance Control Sensor Front, HDD Navigation System, HLDF Touchscreen, Heated and Power Fold Mirrors with memory, Heated Front Windscreen, Starter System - Stop/Start, Xenon Headlamps with LED Signature, Automatic Low Light Sensing Headlights, Integrated Approach Lamps, Headlamp Power Washers, Voice Control, DAB, Bluetooth Connectivity, Hi-Line Audio System, SOS/Assistance Call, Adaptive Dynamics, Auto Dimming Mirror, Leather Steering Wheel, Ambient Lighting, Cruise Control. This vehicle has been fitted with £7,255 worth of optional equipment including 22inch 5 split spoke Style 504, Sliding Panoramic Roof, Climate Front Seats with Climate Rear Seats, Privacy Glass with Solar Attenuating Windscreen, Grand Black Veneer Finisher, Red Painted Brake calipers, Customer Configurable Interior Mood Lighting, Full Size Spare Wheel. Includes toolkit, Leather Heated Steering Wheel, Automatic Headlamps with High Beam Assist, Corris Grey Metallic Paint.Standard specification highlights include Rear View Camera, Park Distance Control Sensor Front, 16-Way Electric Front Seats with Memory, Heated and Power Fold Mirrors with memory, DAB, Adaptive Dynamics, Heated Front Windscreen, Privacy Glass, Headlamp Power Washers, Front fog lamps, Cruise Control. This vehicle has been fitted with £4,180 worth of optional equipment including 22inch 5 split spoke Style 504, Climate Front Seats with Climate Rear Seats, Privacy Glass with Solar Attenuating Windscreen, Customer Configurable Interior Mood Lighting, Full Size Spare Wheel. Includes toolkit, Causeway Grey Premium Metallic.Standard specification highlights include Rear View Camera, Veneer-Dark Grey Oak/Brushed Alum, HLDF Touchscreen, Heated Seats - Front and Rear, 16-Way Electric Front Seats with Memory, Starter System - Stop/Start, Heated and Power Fold Mirrors with memory, Xenon Headlamps with LED Signature, DAB, Hi-Line Audio System, Cruise Control, Double Locking.